Roasted Radish Polenta | Naturally. If you’ve never had a roasted radish, now is the time to start. I grew up eating only raw radishes (usually pulled straight from my grandfather’s garden and dipped with a bit of salt) but the cooked radish is not to be missed. The bite that a raw radish has is mellowed by the roasting process, creating a flavor that is earthy and a bit more smooth. In recipe, the polenta serves as compliment to the roasted radish but I have a few more variations below if you’re not into making polenta. Bring the vegetable broth and water to a boil in a medium pot. Add in the polenta, whisking quite a bit, until the mixture begins to thicken. Reduce the heat to a simmer, cover, and let cook for 25 to 30 minutes, stirring every once in awhile ([url:1]full technique can be found here[/url)). Once done, stir in butter and salt/pepper as desired. After you get the polenta started, preheat oven to 375˚. Toss the quartered radishes with the scallions, olive oil, salt, and pepper. Spread out onto a single layer on a sheet tray covered with parchment paper. Place in over and roast for 15 minutes. Remove from oven, stir in the chickpeas, and return to the oven for 5 to 10 minutes- just until the radishes are tender/ starting to brown and the chickpeas are warm. Remove from oven, add the lemon juice and parsley, and toss until well combined. 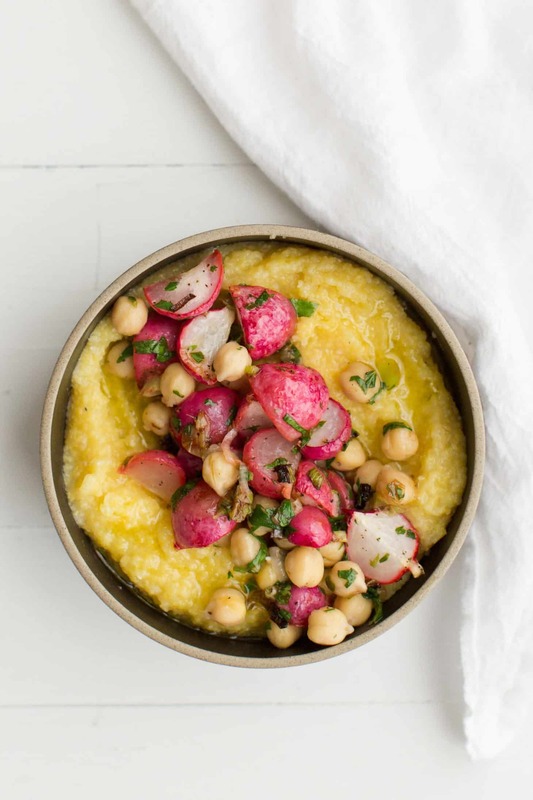 Divide polenta into two bowls and top with the radish mixture and a drizzle of olive oil. + If you would like to make this vegan, swap butter for your favorite vegan butter or olive oil. + If you would like to add cheese, I recommend tossing feta in with the radish/chickpea mixture. Breakfast: Radish and eggs are a wonderful combination: try this radish mixture (without the chickpeas) in an omelette, on toast with a poached egg, or on top of a savory bowl of oats. Salad: Like the harissa roasted carrots, this radish mixture works amazing tossed with greens and/or grains. If you’re eating this polenta for dinner, make extra radishes and toss in your lunch the next day. Salsa: A slight twist, but I love radish salsa and using roasted radish would be an excellent variation. You always make polenta look so creamy and delicious – I’ve got it down on next week’s shopping list so I can give this recipe a try! Definitely saving this, I’ve never tried polenta. It just looks so yellow and intimidating but some how you made it look delicious, I’m very keen on trying it now! Like the look of this! 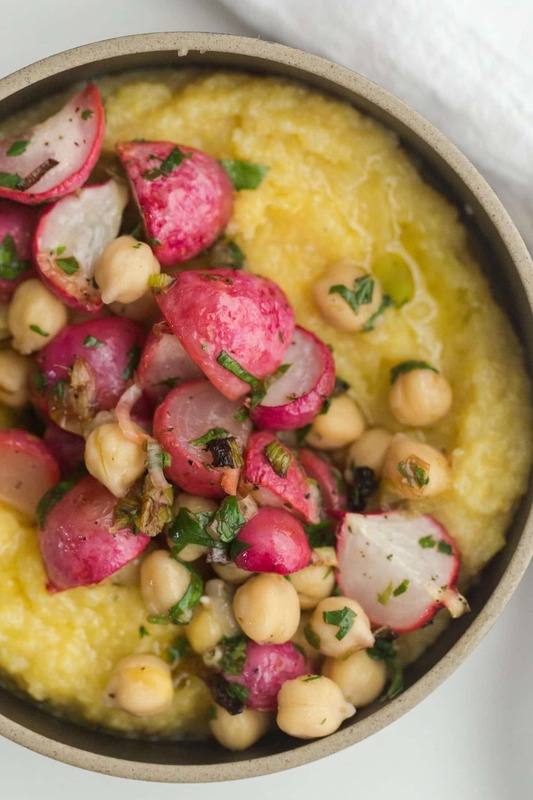 I’ve only ever eaten radishes raw but I love them – and anything with polenta is good in my books! I’ve only ever had roasted radish once and was pleasantly surprised by the tast! 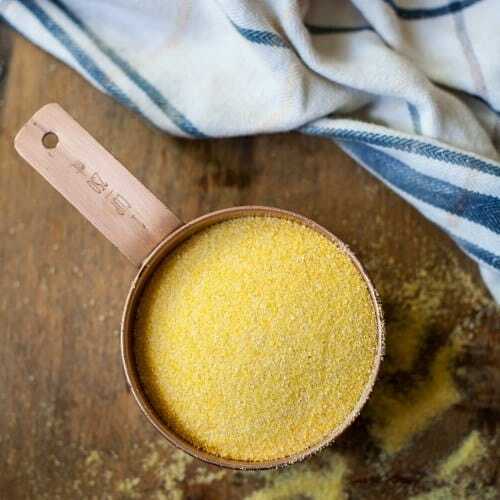 I’ve got a bit of a think about polenta at the moment, I love this! 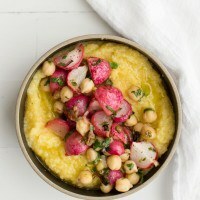 We love polenta and I made roasted radishes once and they were well received. This recipe looks perfect! Thank you for sharing! I’ve never roasted radishes before – they sound delightful. This is such a pretty dish I can’t wait to give it a try! This looks so vibrantly colorful, Erin! Just wanted to let you know how much I LOVE this recipe! Made it once last summer, and again as soon as I picked up my first farm fresh radishes this spring. I used leeks instead of scallions this round (just what I had on hand) and it was delicious as ever. My carnivore dad and aunt were super enthusiastic about the meal as well 🙂 Thanks for your site! You and ‘Minimalist Baker’ are my two go-tos. Planning to make a ‘spicy peanut vegetable noodle bowl’ inspired dish for my cousin and me this evening… Your recipes make me excited to cook for myself and loved ones. I wasn’t a big fan of radishes . . . till I tried them in this recipe! I used three large watermelon radishes and a couple of carrots and doubled the recipe to stretch it to four servings. Everyone was so pleasantly surprised by how delicious it was. I’ll definitely be making it again. Thanks for the recipe, Erin!